California cuisine in a charming cottage above La Jolla cove. : Brockton Villa, a restored beach bungalow from 1894, boasts a million-dollar view of La Jolla’s famed cove. 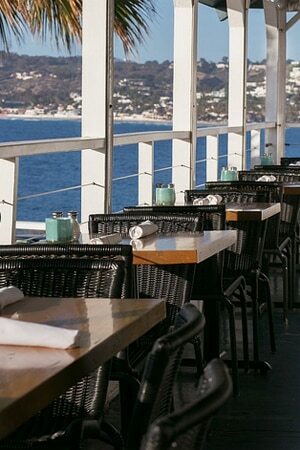 It’s the perfect spot to take out-of-town guests for a quintessential Southern California experience. Enjoy al fresco dining on either of the two decks or warm up by the abalone shell fireplace built in the early 1900s. Try the Coast Toast, soufflé-like french toast made with a hint of orange; or the Eggs Ipanema, poached eggs on English muffins with tomato, crab cakes and spicy tomato-coconut sauce. Lunch favorites include organic grilled salmon BLTs and the cashew-crusted Brie with a port reduction and crostini. At night, the Brockton Villa cioppino is served with a grilled baguette for dipping. Macadamia-crusted scallops pair well with orzo salad, as does the New Zealand lamb with mint and citrus couscous. Triple chocolate mousse cake or dark cherry and walnut bread pudding make for a nice finish as you breathe in the view. Whales can be spotted frolicking in the cove from December to April, adding to the overall experience.